Quine said when a traditional rocket ship launches from Earth, it flies vertically about 15-25km (9-15 miles) before hitting drop-off stages, when sections of the rocket drop back to Earth, usually falling into the ocean. During the final stage when it enters space it is flying horizontally. The ThothX Tower will eliminate the need for the vertical flight and drop-off stages, which are very energy intensive. Quine said the tower will also be open to tourists, providing a way for people to experience space-like conditions without losing gravity. 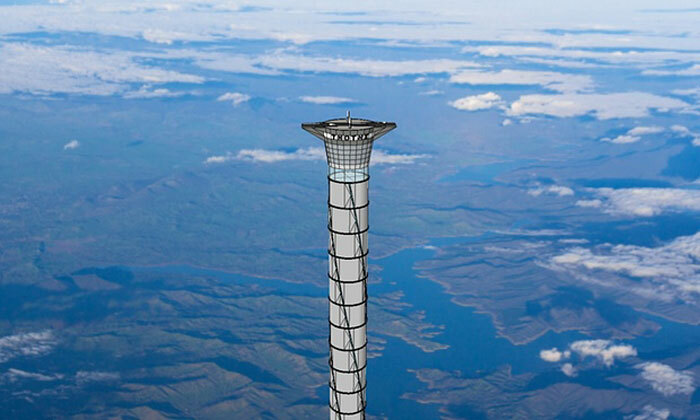 Citing science-fiction author Arthur C Clarke’s proposal of a space elevator in his 1978 novel The Fountains of Paradise, Quine explains in the patent that a space elevator could be constructed with a cable and counterbalanced mass system. Thoth’s president and CEO, Caroline Roberts, said space travel, coupled with self-landing rocket technologies being developed by other companies, will bring a new era of space transportation. “Landing on a barge at sea level is a great demonstration, but landing at 12 miles above sea level will make space flight more like taking a passenger jet,” she said in the statement.